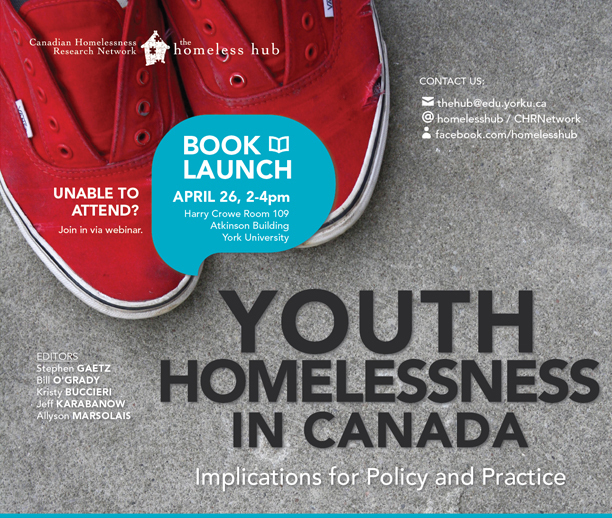 April 26 from 2-4pm, launch of Youth Homelessness in Canada: Implications for Policy and Practice. This book launch event is taking place at York University, Atkinson building, Harry Crowe Room 109 and will also be broadcast live via webinar. Youth homelessness is a seemingly intractable problem in Canada. In communities across the country, people are increasingly aware of the sight of young people who are without a home, sleeping in parks, sitting on sidewalks or asking for money. What do we know about these young people, and what should we do? Youth Homelessness in Canada: Implications for Policy and Practice aims to fill a gap in the information available on this important issue by providing an easily accessible collection of the best Canadian research and policy analysis in the field. Youth Homelessness in Canada: Implications for Policy and Practice will be available as a free eBook. A limited number of print copies will also be available for purchase.